Yachting Boating World: Uber’s boat service across the Bosphorus in Turkey is slowly beginning to gain momentum, after its launch in June this year. Just a year after Uber began to service Turkey with its taxi service, the company announced UberBOAT, a service to transport people from Europe to Asia. UberBOAT, which has teamed with Turkish boat company Navette, allows people to order the boats in the same way as they order Uber cars. Through a smartphone app, users locate the nearest boat and when the captain calls to confirm availability, the boat arrives and the journey begins. Uber launched the scheme after recognising that Istanbul, Turkey’s largest city, experiences severely heavy traffic and can make it difficult for people to get around. “It is an alternative way to escape the city traffic and ease congestion on the roads, particularly on the two bridges that link Europe and Asia,” Austin Kim, Uber’s operation manager for Turkey, told AFP. “By boat, you cross (the Bosphorus Strait) in five minutes, whereas by car, it takes about an hour and a half,” he said. Fares start at 50 Turkish liras ($16 / 15 euros) but can be split between passengers. Each boat can hold up 10 people at a time. Three months after launching, the new service has seen a greater demand across weekends. “We have more clients at weekends. I would say that we carry around 50-60 people per week,” said the captain of one of the boats. UberBOAT is struggling to gain more customers due to fierce competition between transport services ferrying across the Bosphorus Strait. Public ferries between the European and Asian sides of Istanbul can cost as little as 2.15 lira ($0.71) per ride. Alternatively, there is the option of a water cab, which charges 46 Turkish lira (approximately $16 dollars) and additional fares for each nautical mile. The Turkish government is currently working on a project to build “Kanal Istanbul,” another strait to bypass the Bosphorus to ease the boat traffic in the narrow waterway. Uber remains a controversial company and is facing numerous challenges from other transport services across the world, including TFL, who have published proposed new rules for apps including Uber. The proposals include a mandatory five minute wait time, even if a car is available just around the corner. This means users will be unable to see the nearest cars when they open the app. As Uber’s reach continues to grow around the world, the company is increasingly experimenting with different types of transportation, including UberBOAT. Motorboat & Yachting: Wessex Bristol, specialists in buying luxury brand names with a proven historical record, acquires Fairline Boats from Better Capital. 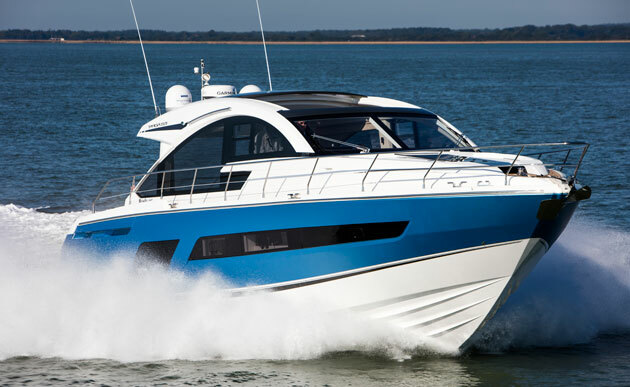 Better Capital has sold Fairline Boats to private equity investor Wessex Bristol for what has been described as “ a modest deferred consideration”. The Somerset based investment business specialises in buying luxury brand names with a proven historical record. 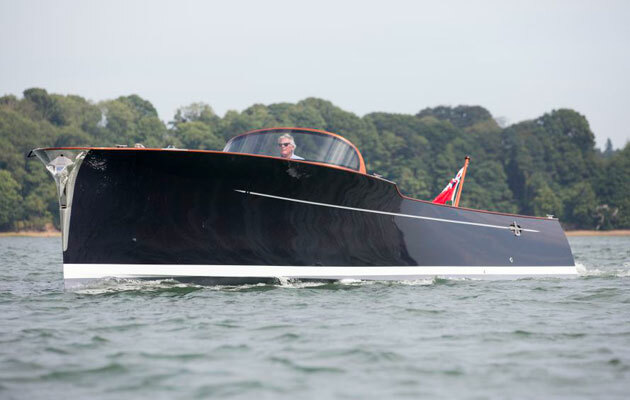 To date most of its investments have been in high end furniture makers, although it already owns the British sportsboat brand Fletcher Boats. Ayiaz Ahmed will take over as CEO of Fairline on 29 September. The deal ends months of speculation about Fairline after a troubled few years in which the Oundle based yard was headed by five different CEOs. It’s not yet clear what the future holds for Fairline under Wessex Bristol but the recent launch of a new Targa 53 at the Southampton Boat Show provides a much needed new model in the range and a promising foundation on which to build. Pratical Boat Owner: Four people were abducted late on 21 September from the Ocean View Resort on Samal island, near Davao City, the largest city on Mindanao island in the southern Philippines. Cruising sailors’ website Noonsite has received an eye witness statement about the kidnapping that happened at Holiday Ocean View Marina on Samal island. The four people abducted on the night of 21 September were Canadian John Ridsdel of the catamaran Aziza, Canadian Robert Hall and his Filipino partner of the yacht Renova, and the marina’s Norwegian yard manager Kjartan Sekkingstad of yacht Wiskun. 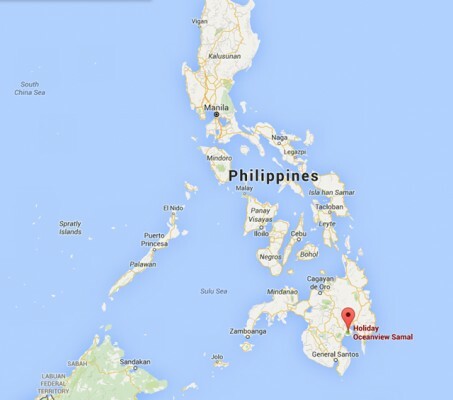 At about 23:20 on Monday night, 21 September 2015, the marina and boat yard on Samal Island, Davao, Philippines, was attacked by a group of about 10 armed and as yet unidentified men, apparently intent on taking four hostages. It was a difficult situation with two cruisers hurt and others badly frightened by the altercations on the docks. It appeared from the CCTV camera footage that after landing on the NE corner of the outer breakwater in two local boats, the group of armed men split up and spread out into the facility including the two marina docks. Two cruisers that were still awake were taken from each dock. Two other cruisers that resisted were hurt, not seriously, but were not taken. Included in those taken was the yard manager, who was responding to cries for help from the docks. The two guards on the property were unable to respond in time to prevent the abductions. The incident was over and the group had boarded their boats and escaped with the four hostages, within about 15 minutes. Not long afterwards, the police, military and island officials arrived and a search was initiated. Shortly after that, the bottom of Davao Gulf was sealed off by a Navy and Coast Guard blockade, and the military had search units combing the Gulf of Davao shores for the boats. By the following morning, mayors from all the towns on the Gulf had been contacted to be on the lookout for these boats. The following afternoon the two boats used by the armed men were found abandoned on the Davao Gulf eastern shore and the search and tracking efforts are continuing. No positive identification of the persons involved has been made and no group has as yet claimed responsibility. The incident has drawn the attention of the world media, and the President of the Philippines has made the recovery of the hostages one of his top priorities. All of the Philippine military and police services are involved in the search. During a meeting held by the marina owners on 23 September, the resident cruisers were given a briefing on the status of the investigation and the search for the hostages. Also, they were given a description of the substantial planned security improvements for the facilities, including a possible permanent military contingent, all to be supervised by a new staff security manager. Because of the absence of the yard manager, temporary yard and marina managers will be appointed in the near future so that the facilities can remain open for business. In summary, the Holiday Ocean View Marina and yard facilities here on Samal Island remain intact and will continue business as usual. In view of the unexpected incident, the security will be greatly improved with facility upgrades and additional guards and training. None of the 50-plus boats currently in the marina have plans to leave because of this incident. The location of the marina south of the NW Pacific typhoon zone and the quality of facilities and surrounding area are considered too good to move elsewhere. For anyone reading this that had plans to come to the marina in the next few months, they should contact the marina at Info@HolidayOceanViewMarina.com in order to confirm their intentions. Motorboat & Yachting: The latest British Marine survey has reported rising employment levels, business activity and profits in the boating industry. Rising employment levels, investment and profits have boosted the UK’s boating industry over the past year, according to the last British Marine survey. The industry body presented its findings at the Southampton Boat Show last week (September 18) and the outlook was positive on all fronts. Of the 321 companies surveyed, 39% reported increased business activity, compared with 37% last year, while 50% reported increased profits (up 1% on 2014’s figure). The Marine Industry Trends survey also found that 30% of companies have taken on more staff in the past year, compared with just 24% last time around. This lead to a positive outlook, with 41% of companies saying they were confident about the next six months, up 10% from the 2014 survey. And the good news for customers is that despite all of this, 56% of British Marine members said they plan to keep their prices at the same level, compared to just 43% before. Alastair Wilson, senior researcher at British Marine, said: “It’s fantastic to see that the findings survey are so positive. We are continuing to see our members within the sector experience positive growth for their business. Other key findings in the British Marine survey included a rise in investment for 45% of firms (up from 39%), while 53% reported increasing turnover (down from 60%). British Marine plans to release its next snapshot of industry opinion in November. Motorboat & Yachting: Baddies give chase in a pair of identical black Frauscher Mirage speedboats as James Bond tows a water-skier. The newest James Bond movie Spectre comes out next month but for fans who can’t wait that long, Heineken has released a slice of 007 action as part of their latest ad campaign ‘The Chase’. In this tongue-in-cheek advert, Daniel Craig jumps into a Riva-esque tender and is pursued by a gang of bearded villains driving two identical Frauscher Mirage powerboats. The comic twist is added by a female water-skier who is unwittingly towed along for the journey, disrupting a wedding, stealing Odd Job’s hat and (you guessed it) picking up a tray of Heineken in the process. If rumours are to be believed, this is a taste of the kind of high-speed on-the-water action we can expect from director Sam Mendes’ upcoming blockbuster, which is released in the UK on October 26. Pratical Boat Owner: A 10m yacht that ran aground two miles north of Hook Head, in County Wexford, Ireland is believed to have drifted free from its moorings. Volunteer lifeboat crew launched yesterday morning following reports of the grounded cruiser. Upon arrival, the lifeboat crew found the unmanned yacht sitting deep in the water, perilously close to the rocks. First on scene was Fethard RNLI Inshore lifeboat whose crew established a tow with the yacht, however this proved unsuccessful. Shortly after, Dunmore East RNLI Lifeboat arrived on scene and put two crew on board the casualty vessel with a pump to try and drain the water from the yacht and establish a tow to recover it to a nearby harbour. However, once on board, the lifeboat crew discovered that the yacht had taken on a large amount of water and that it was in danger of sinking. When they attempted to establish a tow the vessel dangerously dipped low into the water and the attempt was abandoned. The Irish Coast Guard Rescue Helicopter Rescue 117 were also called out to the incident. A decision was taken to leave the vessel as it was determined that the crew were in danger if they stayed on the yacht. 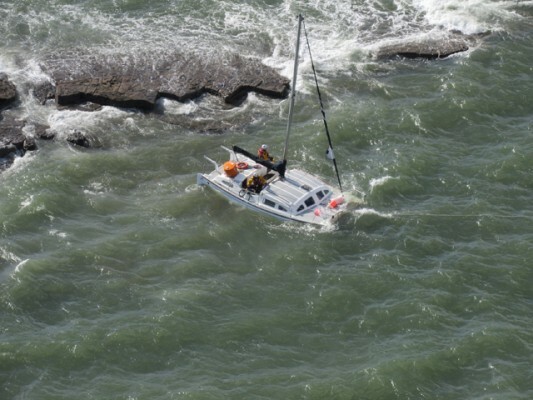 Dunmore East RNLI Lifeboat spokesman Neville Murphy said, ‘The yacht had taken on a huge amount of water and as such it proved too difficult to safely recover her. At present the vessel is still aground and an attempt may be made to recover her at low water. Motorboat & Yachting: The British sailboat manufacturer will be exhibiting the Spirit Yachts P40C this week at the Monaco Yacht Show. Ipswich-based yachtmaker Spirit Yachts has expanded its range of powerboats with the launch of the Spirit Yachts P40C, which is on display this week at the Monaco Yacht Show (23-26 September). The new arrival weighs in at just 4.5 tonnes, meaning that its twin 260hp Yanmar inboard engines are capable of propelling it up to a top speed of 40 knots. The Spirit Yachts P40C also has the styling to fit in among the Monaco jet set, with the graceful lines and high-quality materials that you’d expect from a superyacht tender. Sean McMillan, CEO and chief designer at Spirit Yachts, said: “We have applied the same level of attention to detail and technicality to the P40 as we do to our range of sailing yachts. Below decks, Spirit Yachts have fitted an en-suite double cabin that is fully air conditioned, while other key features include a transom shower and cockpit galley with a sink and hob. If the fully open deck design show here doesn’t suit, then there is the option of a semi-enclosed wheelhouse instead, while a crew cabin can also be specified as a cost extra. The Spirit Yachts P40C will be available for test-drives throughout the Monaco Yacht Show, and our first-drive review will be published in the December issue of Motor Boat & Yachting. Motorboat & Yachting: Spanish firefighters were called to the aid of a sinking superyacht last week, after its four bilge pumps failed to stop the flow of water. 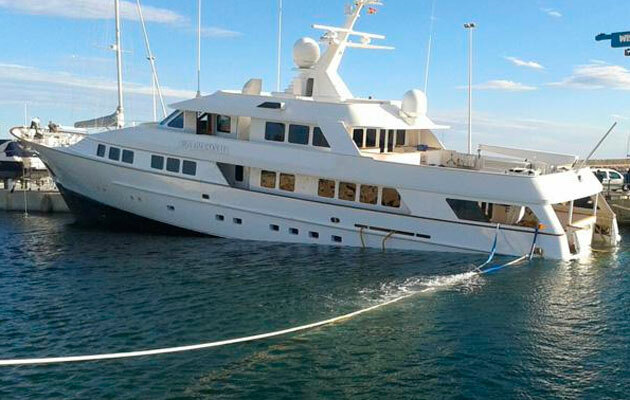 Firefighters were called into refit yard Varadero Port Denia last week, after initial efforts to save a sinking superyacht proved in vain. The 150ft custom motoryacht Sea Falcon II began taking on water in the stern on September 17, and staff on site were unable to stop the flow of water, despite using all four on-board bilge pumps. After a call was made to the local fire service at 0830, four more pumps were pressed into action by 1200, saving the sinking superyacht from a soggy fate. No-one was injured and no oil contamination was reported, according to local publication Las Provincias. 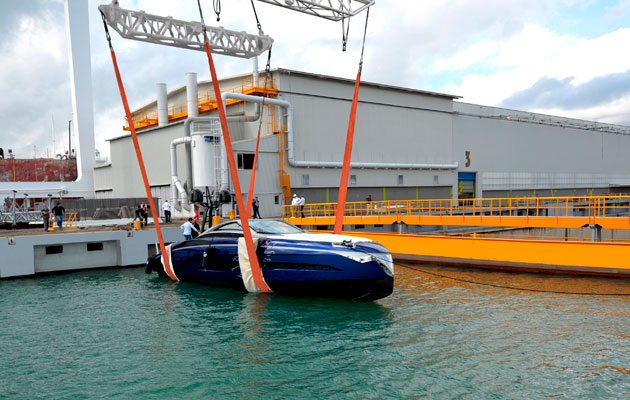 Almost a week after the incident and the cause of the sinking superyacht is still a mystery, a spokesperson for the yard told MBY this morning. Varadero Port Denia is located 60 miles north-east of Alicante on the Spanish coast and current refit projects include a 142ft Perini Navi and 204ft superyacht Yaakun. Pratical Boat Owner: More than 110,000 people flocked to the 2015 Southampton Boat Show, which drew to a close on Sunday, to experience Britain’s biggest boating festival. Visitor numbers were down on last year’s footfall of more than 112,000 people across 10 days, however exhibitors reported strong sales from this year’s event. The 2015 show saw 23 boats make their world debut and more than 330 sailboats and powerboats exhibited at the purpose-built marina. Many companies reported an increase on last year’s figures including multi-million pound deals. Some serious marine business were conducted with contracts between the marine divisions of companies such as Rolls-Royce and Sunseeker International being signed. The show kicked off in style with F1 presenter, Suzi Perry opening the Sunseeker stand with Britain’s Got Talent winners, Collabro. 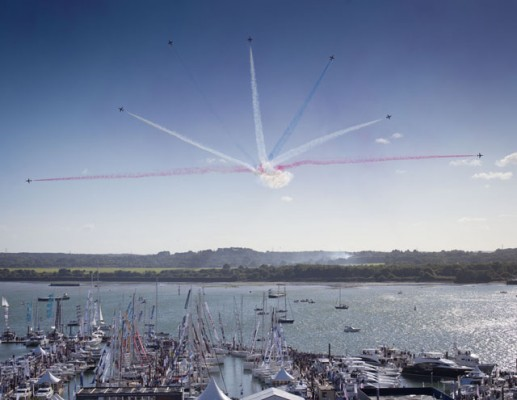 The Red Arrows provided visitors with a show-stopping display over the purpose-built marina on the first weekend, with sailing legends Sir Robin Knox-Johnston and Olympian Annie Lush both making appearances. 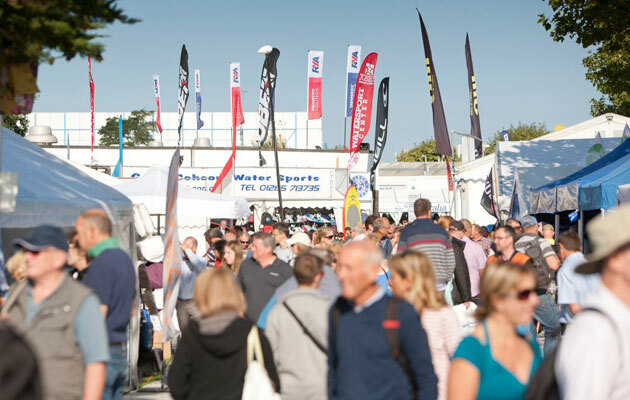 Murray Ellis, managing director of British Marine Boat Shows said: ‘We have had yet another incredibly successful Southampton Boat Show with more than 10,000 visitors getting out on the water for free. ‘Our attractions have been very popular this year with over 18,000 visits to our tall ship , the Earl of Pembroke, 5,300 rides on the Honda Boat Show Eye and over 27,000 visitors to the Show’s very own Aquarium. Motorboat & Yachting: The worlds of watchmaking and boat manufacturing have come together in the latest model from Italian Sea Group, the Franck Muller 55. Italian Sea Group has announced details of its new Franck Muller range, which will be unveiled later this week at the Monaco Yacht Show (September 23-26). Named after and developed in collaboration with the high-end Swiss watchmaker, the first model to be launched from the range is the Franck Muller 55, an open sportscruiser that its designers are billing as “the ultimate toy”. Hull #1 will come fitted with twin Volvo Penta IPS 950 pod drives for a top speed of 35 knots, although a more powerful IPS 1200 version will be available in due course and should be capable of hitting 40 knots. Below decks there are two cabins, with ensuite accommodation for the owners plus two guests, while the open-plan teak-laid cockpit provides plenty of socialising space. The lavish interior design includes ebony cabinetry, marble worktops and ten different types of hand-woven leather upholstery. Other key features include plenty of exterior LED lights, which the designers claim will create “an artwork at night”. Franck Muller branded carbon poles and a canvas cover are included, but for those facing unfavourable weather on a more regular basis, the yard plans to launch a hard-top version in the future. Indeed, the Italian Sea Group has ambitious plans for the Franck Muller range, with 68 Open, 68 HT, 80 HT and 108 RPH models all in development. Visitors to the Monaco Yacht Show will get the first chance to glimpse the Franck Muller 55 on the water later this week, before it is shipped across the Atlantic for the Fort Lauderdale International Boat Show (November 5-9).